Browse some of Pete’s Custom Golf Carts for sale in the grid below. These carts are ready to drive away. AKA “turn-key”! If you’d like to save some dollars, checkout the used custom carts section, too. Pete has repeat and return customer that want something new and fresh every season so they trade in last years cart for something different. So Pete usually has some really cool carts that are slightly used for much less than a new custom. 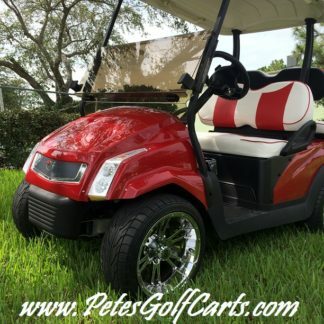 Pete also sells all sorts of Custom Golf Cart Parts and Accessories for your cart. All makes and models Club Car, Ezgo and Yamaha to name a few. Pete’s Golf Carts of South Florida… Home of the Beach Beast and The Street Beast! You want something no one else has Pete’s your guy. Are you looking for a little bit more?! If you are looking for a custom golf cart but want something a little different or something just outrageous. Pete’s Team will build the custom golf cart of your dreams. Built to order exactly the way you want it! Custom Golf cart Body Kits, Custom Paint, Lift Kits, Tires, Wheels, Custom Seats, Passenger Requirements or Special Applications ( Advertising ), Stereo Systems, Performance Upgrades for (Gas or Electric Golf Carts) Mild to Wild… You dream it Pete’s team can build it! Or if you are a kindred spirit like Pete and want another project to tinker with in the garage and build one yourself you have come to the right place because Pete offers ALL The Parts and Accessories Your Cart Will Ever Need!!! All Orders Over $99 Ship Free Anywhere in the Continental US (Lower 48 States). All The Custom Golf Cart Parts and Accessories Your Cart Will Ever Need!